Green Key, known in times long past as Deer Key, was originally a mangrove island a short distance off the Gulf Shore west of New Port Richey. In the 1930's a home was built on the island, and the owners submitted plans to subdivide the property for development. A causeway to the mainland was built, and a man-made beach was created to make the property more attractive to investors. When a storm washed away the beach, plans fell through. In subsequent years, the beach area was again renourished and a retaining wall constructed. The land eventually came under control of Pasco County, and a portion of the area was established as a county park. Officially named "Robert K. Rees Memorial Park" after a county commissioner and head of the parks department, locals still usually refer to it as "Green Key Beach". 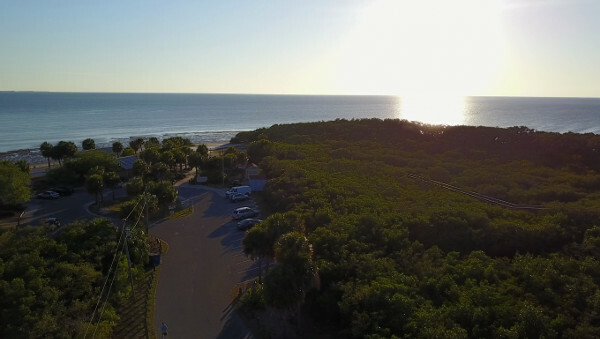 The Nature Coast of Florida is not known for its beaches, so Green Key is something of a rarity. Local residents flock here on hot summer days to enjoy the water, and in the evening for a good view of the sunset. Two large picnic pavilions are available, along with grills, picnic tables and a playground. On weekends it is common to find a food vendor selling hot dogs at the park. Bird and nature lovers will enjoy the boardwalk through the mangroves to a small pavilion lookout on the northwest shore of the key. Due in large part to the proximity of nearby Robert Crown Wilderness Area, Green Key is home to a large variety of rare and endangered birds. The video included above provides a good view of that area ... although it was shot at low tide. The Gulf waters normally come up and under the shelter. The main portion of the swimming area on the beach can also be exposed at a very low tide. It is possible and permissable to launch a kayak from Green Key Beach. However, you might find it more convenient to park along Green Key Road at any of the several launch sites on the causeway. Launch from the south side of the road to explore the Robert Crown Wilderness Area. Or start from the north side of the road to visit Oyster Creek, Wigman Creek, Rocky Creek, or the Pithlachascotee River. Launching motorboats is not permitted at the park or along the causeway.